JLPP is inherited as a recessive trait. In a recessive disease, both parents of an affected pup show no signs of disease. All animals have two copies of each gene, one gene is inherited from the mother and one gene inherited from the father. A dog that has one normal gene and one gene that causes the disease is a carrier of the trait. They show no symptoms because the one good gene is enough for their nerves to develop normally, but they will pass that bad gene on to about half of their offspring. If a carrier dog is bred to another carrier, then about 25% on average will get a bad gene from each parent. The puppy then gets the JLPP disease. Only test your male first! If your male is clear then your puppies will not get the JLPP disease. If your male tests positive then all your females must be tested. If any female is positive for your breeding program then the sire and dame that both test positive cannot be bred together ever! Its that simple. The brain controls muscles through signals that travel through nerves. A disease that affects the nerves is called a polyneuropathy. Due to a quirk in the way an embryo develops, one of the longest nerves in the body supplies the muscles of the voice box (larynx). The vocal folds vibrate as air moves over them allowing a dog to bark. When the dog breathes in, muscles in the larynx pull the vocal folds aside so that air can move easily into their lungs. If nerves are unable to convey that message properly, the muscles become weak or paralyzed. 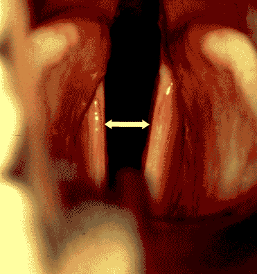 The longest nerves are often affected first; hence laryngeal paralysis is the first symptom. The vocal folds cannot be pulled out of the way as the dog breaths in. They vibrate noisily and can obstruct the flow of air into the lungs particularly when exercised or hot. The dog may also choke on their food or water or regurgitate, which can result in pneumonia.